Has Punjab’s obsession with cancer robbed its poor of healthcare? The state spends little on healthcare. And even that money is directed in all the wrong places. “Private waley kehte hain ghar le ja kar sewa karo." Private hospitals tell us to tend to the patient at home if we cannot pay their fee. That was Mohan Lal Shonky’s response when asked how he and others in the poor quarter of Nurmahal town in Punjab’s Jalandhar district use medical services. Shonky, 55 years old and in poor health, is in the ghoda gaadi business. He and his sons rent out their horses and carriage during the wedding season. In a good year, they make about Rs 1.5 lakh between January and March. But this season, given the poor cotton and paddy harvests in Punjab, he expects no more than Rs 1 lakh. This, along with his sons’ earnings as labourers – will have to support them through the year. Everywhere in Nurmahal’s Kuchapakka colony, you hear the same story, with some variations. Kishan Chand and his wife Amro are also in the ghoda gaadi business. For minor ailments, the family goes to the chemist stores in Nurmahal. “There are 30-40 chemist shops here,” said Amro. “Some of the boys did their training with doctors, and then set up their own shops.” They give out medicines based on the symptoms and don’t take fees. Why doesn’t she go to a doctor first? “They charge Rs 200-Rs 300 sirf dekhney ke liye. Dawai ka alag." They charge Rs 200-Rs 300 just to see the patient. And an additional sum for the medicine. For more serious ailments, often, the community comes to the rescue. Like the time Lajja Devi fell seriously ill. Local doctors pitched in with cheap medicines, relatives and others gave money, and yet others donated blood. Talk about healthcare in Punjab and the conversation invariably veers to the misplaced priorities of the state’s healthcare system, and how it’s letting down the most vulnerable. It came up in Nurmahal. It shows up in the government’s low per capita spending on health. And in the National Sample Survey Office’s 2015 numbers, which reveals that households in Punjab have the highest out-of-pocket expenditure on healthcare in the country – Rs 28,539, against the national average of Rs 18,628. It’s a puzzling drift. During the 1960s and 1970s, Punjab spent more on health than most states in India, says Rajesh Kumar, head of the School of Public Health at Chandigarh’s Postgraduate Institute of Medical Education and Research. So what explains this reversal? Militancy is part of the answer. Once it started, says Kumar, the state began diverting a lot of its revenues to counter the insurgents demanding a separate country called Khalistan. However, even after the insurgency ended, things didn’t improve, partly because of the precarious state of Punjab’s financials. For several years, the costs of running the government – paying salaries, pensions, retirement benefits and other establishment costs – have been higher than what the government collects as revenues. Compounding this is the state government’s puzzling unwillingness to boost revenue collection, while expanding subsidies like free power. The previous story in this series highlighted the inability of municipal corporations to collect revenues. A similar trend also plays out in state finances, says Sucha Singh Gill, Director-General of Chandigarh’s Centre for Research in Rural and Industrial Development. Octroi alone, Gill says, used to account for 25% of the government income. But the state was at the time increasing farmers’ subsidies, and the decision to abolish octroi was a sop for the Bharatiya Janata Party’s constituency of traders and businesspeople. Punjab, he said, is losing revenue from all three – excise, transport and real estate. Each of these, he said, owned by people “close to the ruling dispensation” either evade taxes or get tax benefits. Instead, it borrows heavily. And, as a news report in The Tribune says, once the state is done making its interest payments, just 13% of the total money reaching the state government – including loans – is available for development work. As revenues stay low, so do the government’s allocations to the health department. The state, says the 2015 National Health Profile, has a per capita expenditure of Rs 728 on healthcare – less than half of what neighbouring Himachal Pradesh spends. 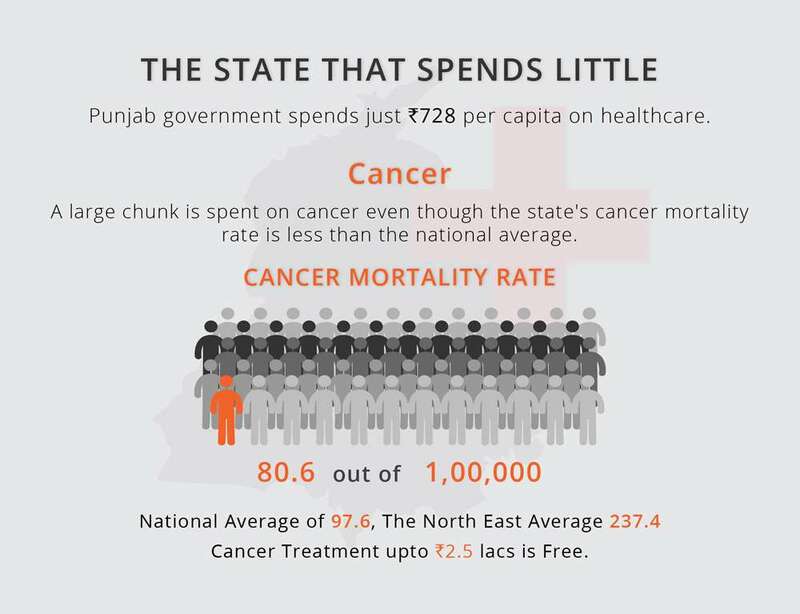 Actual healthcare spends in Punjab are even lower than this, due to the state’s disproportionate focus on cancer. Over the years, a perception has built up that Punjab sees a disproportionately high incidence of cancer. This is not accurate – in a paper published in the March 28, 2012 edition of the medical journal Lancet, Rajesh Kumar and his fellow authors estimated cancer mortality per 100,000 people in Punjab at 80.6 – below the national average of 97.6 and far below the North East with 237.4. Yet so popular is the perception of Punjab being cancer-ridden that the government focuses disproportionately on the disease. Take 2013: that year, the government set aside Rs 500 crore annually to organise medical camps to “eradicate” cancer, and another Rs 450 crore for treating cancer. To put that in perspective, the state’s entire health budget that year was Rs 3,443 crore. “There was a mass cancer screening survey – which ran for a week or two – in 2013,” pointed Shankar Prinja, a health economist at PGIMER’s School for Public Health. "This never gets done for malnourishment." According to Prinja, 81% of the funds that remain is used for salaries and administrative costs; 9% for drugs and other consumables; and the remaining 10% goes into new buildings and equipment. Vini Mahajan, principal secretary (Health) in the Punjab government, did not respond to Scroll.in's questions and requests for a meeting. As a result of limited funds, healthcare in Punjab is suffering in several ways. As a result, he added, “Since there are no general duty doctors, we specialists end up doing a lot of general medicine work, medico-legal cases and even post mortems. Nurses are also in short supply – there is just one for the general ward and another for the emergencies. 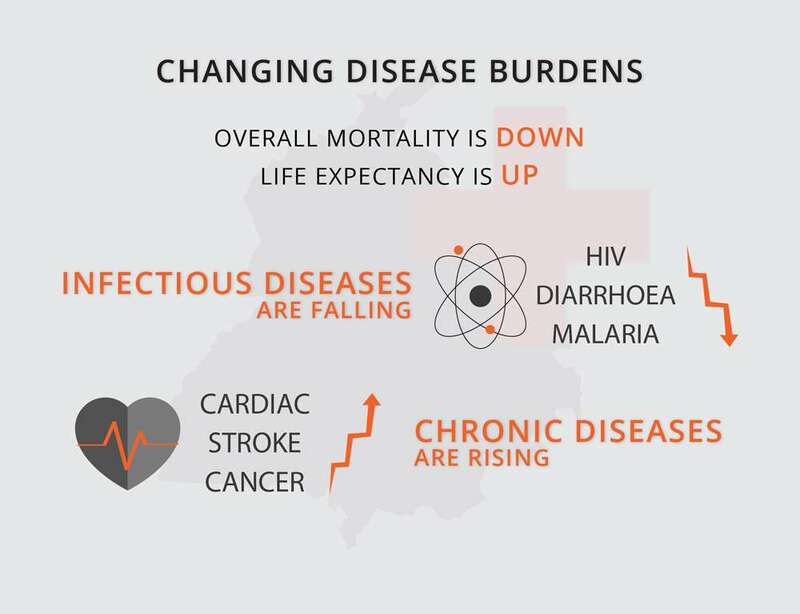 This problem also shows up in evaluation reports for the National Rural Health Mission. For instance, a 2011-’12 field report by a Union health ministry team from the border district of Fazilka notes that “more than 30% posts of Medical Officers and about 24% posts of Specialists were lying vacant in the district”. The shortages are so acute that they do not result merely in poor care – on occasion, they result in denial of care itself. Take the Civil Hospital in Bhatinda. Two years ago, the hospital renovated its Intensive Care Unit, but it is yet to start using it for lack of doctors and nurses. It gets worse: every day, the hospital gets 1,500 new patients at the Outpatient Department, plus people coming for follow-ups, says a doctor attached to the Bhatinda hospital who did not want to be named. Since the doctors are in the OPD, the nursing staff is in charge of the wards. But nurses are in short supply too, and so the 26 beds in the special ward and 53 beds in the medical ward – 79 beds in all – are overseen by just one nurse. The reason for the chronic short-staffing goes back to the insufficiency of funds available for healthcare. Due to which the state is unable to pay market salaries. A surgeon who was drawing Rs 48,000 at the trauma centre in Jalandhar recently joined a private hospital when it offered to treble her salary. 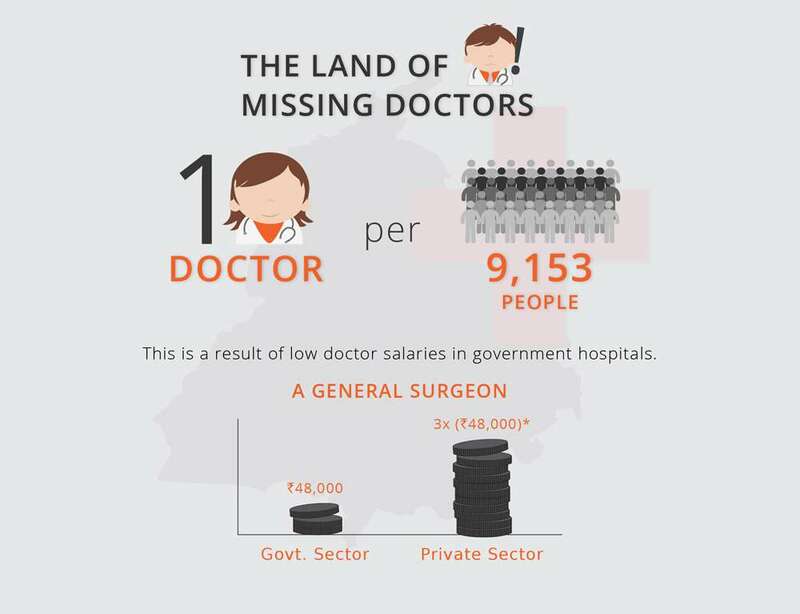 Unsurprising then that, according to the National Health Profile 2015, Punjab has just 3,121 doctors in the government health system to serve a population of 2.77 crore, or one doctor for every 9,153 persons. These numbers compare unfavourably with neighbouring states like Himachal Pradesh (1,419) and Jammu and Kashmir (3,386). The World Health Organization norm is 1:1,000. Meanwhile, with most of the available money (81%) going into salaries, there is underfunding in other sections. Kumar points out that there is no regular supply of medicines or reagents. At the same time, as this article in Down To Earth says, government hospitals which have not received the full complement of staff salaries from the state have had to charge the patients in order to make up the deficit. In other words, patients who cannot afford private care find that even in government hospitals, they have to pay for drugs, diagnostic tests and procedures. Put together, these factors explain why healthcare is expensive in Punjab. Given the shortage of funds, the state health department has turned to increasingly desperate innovations. To combat the shortage of doctors in primary health centres around 2003, it rolled out a model where doctors were hired at a flat rate of Rs 30,000 – out of which they would have to pay for a nurse and a compounder. The outcome, says former joint secretary Cheema, was disastrous. So several doctors, says Cheema, made the compounder run the dispensary, while they focused on their private practice. The compounder would call in for instructions, and the doctor would visit the health centre only about once a week, if that. Another bizarre innovation followed three years ago. The health department in 2013 closed as many as 70 of its 173 sub-divisional hospitals and redeployed staff to the rest. But, as the hospital at Jagraon shows, the problem of understaffing continues. The case of trauma centres is equally illustrative. 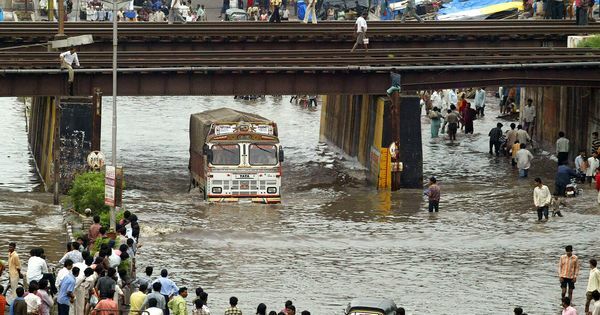 In 2009, a trauma centre funded by the Union government came up in Jalandhar, next to the Civil Hospital. Initially, the Ministry of Health took care of staff costs, but when the responsibility was passed on to the state government in 2014, it converted the trauma centre to a subset of the civil hospital. Since then, staff levels have fallen steeply. As per the original plan, a doctor at the facility says, the 30-bed trauma centre, set up to handle accidents and emergencies, was to have three orthopaedics, three general surgeons, three anaesthetists, 40 staff nurses, six general duty medical officers and three neurosurgeons on call, apart from the Class IV staff. However, after the merger with the main hospital, the government allotted a total of six orthopaedics for the hospital and trauma centre. The shortage of funding, paucity of staff, lack of facilities – that is the calculus of this moment. The sick are forced to rely on private healthcare – but this is expensive, and beyond the reach of most. 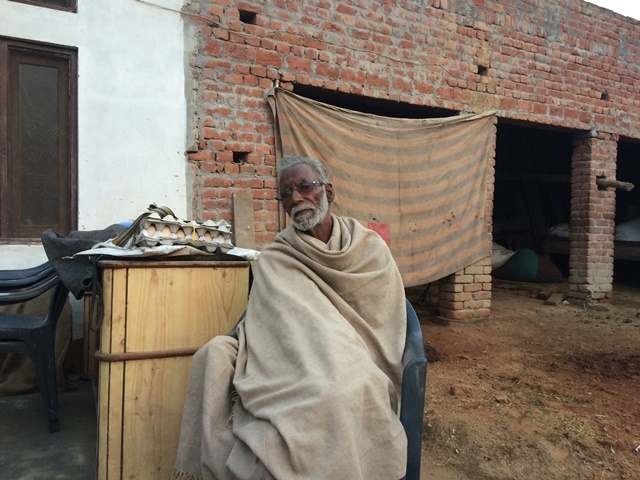 In Punjab, said Gill of Chandigarh’s Centre for Research in Rural and Industrial Development, house owners who earn Rs 10,000 a month live at subsistence levels – and “those earning Rs 10,000 but living in rented homes are at semi-starvation levels”. Dengue too has entered the Punjab. As research from the National Malaria Research Institute shows, the range of its vector mosquito is rising. However, neither the state’s healthcare system nor its municipal infrastructure is in a position to respond. This makes it all the more imperative that the state boost its health spending by amping up its revenue collection. But that, as the next story in this series will show, runs against the business interests of the state’s politicians.